“In the position I was in I was there to deliver academic instruction as well as a stable structured environment in which they could be more successful, but I’m not a trained social worker,” Kittleson said. At first, there was no social worker provided for a number of kids who were supposed to get those services. Kittleson says some students had severe emotional impairment, lashing out, sometimes violently in his self-contained class that was kept separate from the general student population. Social workers help students cope with those emotions. The MDE says in February, a parent (the names are redacted in the documents provided) filed a complaint. State investigators found school staff were told to say students didn’t need those services because the district couldn’t provide them. “This was a real serious vacuum in the program that I was trying to run in my classroom,” Kittleson said. It wasn’t just social workers that Muskegon Heights was missing. A different report from a separate complaint says special education students were not given speech and language, physical therapy, mobility and other services. It says teachers didn’t get help they needed for kids with autism, or with visual and hearing impairments. Students also lacked instructional materials they needed to make progress under Michigan’s Merit Curriculum. Marcie Lipsitt filed that second complaint and she’s waiting on results from a third. Lipsitt heard rumors that there wasn’t any speech therapist in the Muskegon Heights Public School Academy System (MHPSA). “I thought ‘if (students) aren’t receiving speech, they’re clearly not receiving other related services’ and I can file a complaint,” Lipsitt said. As an advocate for special education students based in Southeast Michigan, she frequently files complaints with the state. "They deserve a free and appropriate public education as the Michigan Constitution requires for all children," Lipsitt said. “I’m not 'complaint happy.' I’m never happy about filing a complaint. I file them to fix problems for children,” Lipsitt said. Lipsitt calls the level of noncompliance at Muskegon Heights schools “unspeakable.” She says she tried to contact Mosaica Education, the company that runs the district, before she filed the complaint. She says she didn’t get a response. No one from Mosaica would agree to an interview for this story. Alena Zachery-Ross, the equivalent of the district’s superintendent, issued this written statement. One of MDE's investigations required the district to send letters home this month to parents whose children didn’t receive these services. MDE will require MHPSA to document contact made with these parents and work with those who “wish to develop a plan that addresses educational loss.” Building principals, service providers, and all special education teachers are to undergo training by September. To be clear, there’s a long history of problems with Muskegon Heights’ special education program. Dave Sipka is the superintendent of Muskegon Area Intermediate School District, which has an oversight role in Muskegon Heights. “Unfortunately in this case when a charter company comes into an existing school district with a lot of history you don’t know all the details and you may only find them out as time goes on,” Sipka said. Sipka’s staff filed complaints against Muskegon Heights Public Schools, before it was taken over and made into a charter district. In one of those investigations, the state found the problems “so pervasive” that it declared the whole special education program systematically non-compliant. That report came out in April 2012, the same month Governor Rick Snyder appointed an emergency manager to run the district. By that point MHPS was practically bankrupt. Lipsitt says the intermediate school district and MDE should have done more to prevent non-compliance from continuing as soon as they knew about violations. “When I look at this complaint, I look at children who have lost a year of an educational life that no one can give them back. The district can’t give it back. I can’t give it back. The state can’t give it back,” Lispitt said. Sipka says the solutions are as complicated as the history of problems, and people need to be patient with the process. “Did we report that to the state immediately? No,” Sipka said, “What we did was try to process that with them first because again this is all new territory for everybody in the state of Michigan – having a charter school district." “Mosaica needed to have their act together sooner than they did but with that being said, they have done what I would call a remarkable job in trying to give the services to kids that are needed," Sipka said. Sipka says the company has brought in its national special education director. He says the district has been able to fill some vacant special education positions and brought in contractors to help with other services. MDE Spokeswoman Jan Ellis says there were about 500 noncompliance issues identified in the state during the 2011-12 school year. She the vast majority of school districts involved implemented changes to come into compliance. “When there are problems our goal is to get them fixed and identify with the district and the intermediate school district what supports are necessary to make that happen,” Ellis said. Ellis said it’s difficult to say how this set of complaints stacks up against other districts because “each district is unique.” For example, some district have more active parent groups that are more likely to file complaints than others, Ellis said. MHPS Emergency Manager Don Weatherspoon and the charter district's board president did not respond to requests for comment on this story. 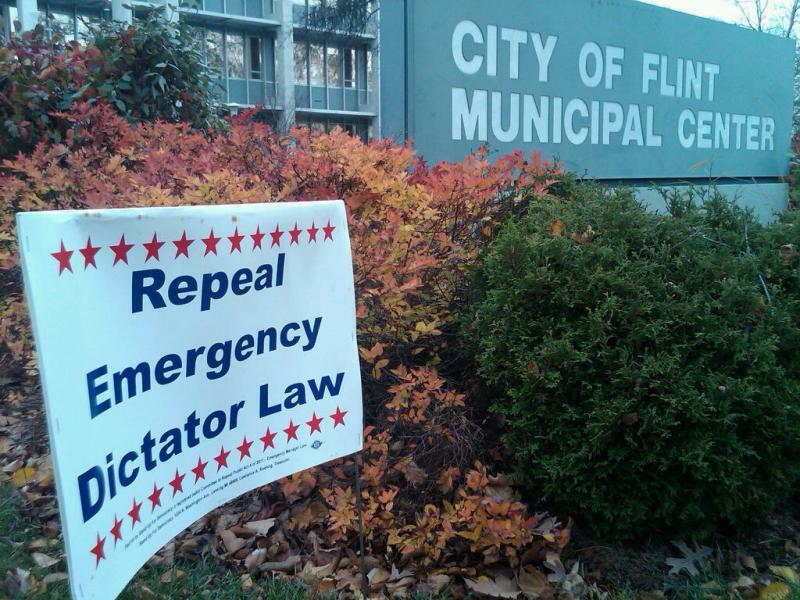 DETROIT (AP) - Leaders of the Detroit branch of the NAACP say they'll file a lawsuit next week challenging Michigan's emergency manager law. The law has allowed Gov. Rick Snyder to put managers in Detroit and other struggling cities and school districts. Critics plan to talk Monday outside the federal courthouse in Detroit. Other legal challenges have not been successful. An Ingham County judge in April threw out a lawsuit that claimed lawmakers violated the Open Meetings Act when it approved the bill in December. Muskegon Heights students are heading back to class today to begin the second half of what’s been a very turbulent school year. This story is the first in a four-part series about how things are going so far in Michigan's first fully privatized public school district. Find part two here, part three here, and part four here. Muskegon Heights Public School Academy mini series. Feature 1 of 4. 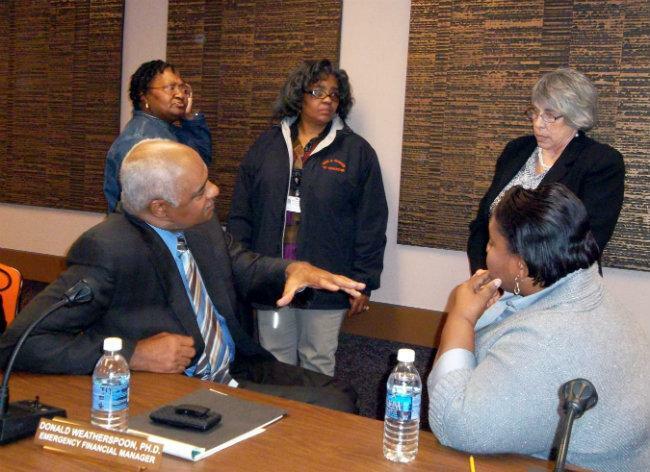 The school board in Muskegon Heights battled a budget deficit for at least six years in a row. They gave up the fight a year ago and asked the state to just take over. “The system that was in place imploded,” said Don Weatherspoon, the guy the state eventually sent in late April to be the emergency manager. "Enrollment went down, costs went up, they borrowed more than they could pay back; you’re on a collision course with disaster and that’s what happened," Weatherspoon explained. Student enrollment is a big factor in how much money a school district receives from the state. “Everything that you can think of basically broke down. Discipline, learning, record-keeping, financial accounting, etc,” Weatherspoon said. By May, Weatherspoon discovered the district is more than $16 million dollars in debt; so much debt it couldn’t afford to open school in the fall. Update: As of February 14th, these teachers have now obtained valid Michigan teaching certificates or permits. Teachers in the new charter school district in Muskegon Heights have now obtained certificates or permits that allow them to legally work in Michigan classrooms. This week Michigan Radio reported the state's first all-charter public school district had at least eight teachers who worked, in some case for months, without a valid Michigan teaching certificate or permit. It’s against state law to do that. Now, public records show those who were still teaching at Muskegon Heights without proper certificates managed to get them this week. Most obtained teacher certificates. Two others obtained substitute permits. The new Muskegon Heights charter school district is welcoming yet another principal at its high school. 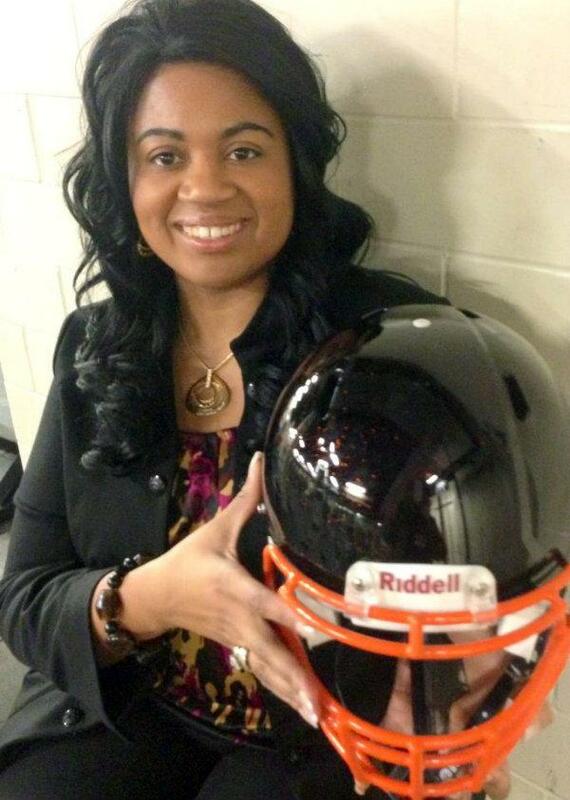 Carla Turner-Laws is the third principal so far this school year. Technically, her title is Interim Head of School/Instructional Specialist. A couple dozen people sharing cookies and pink fruit punch welcomed Turner-Laws at a reception Wednesday night. Most were fellow co-workers, friends and family members. The MHPS district’s state-appointed emergency manager turned the entire district over to a charter school company last June. This story is the third in a four-part series about how things are going so far in Michigan's first fully privatized public school district. Find part one here, part two here and part four here. The decision to convert the Muskegon Heights Public School district into a charter school district was a financial one. But the officials who run the new system hope to improve academics too. From the outside, Edgewood Elementary School looks and sounds the same as any other year. But this year, Mosaica Education, the charter company that’s running the school, hopes a new curriculum, longer school day and year round classes will improve student success. Michigan students enrolled in charter schools learn more in a school year than those in comparable traditional public schools. That’s according to a study released Monday by Stanford University’s Center for Research on Education Outcomes. Researchers at Stanford University looked at the state’s more than 250 charter schools over a five year period ending in 2010. This story is the fourth in a four-part series about how things are going so far in Michigan's first fully privatized public school district. Find part one here, part two here, and part three here. 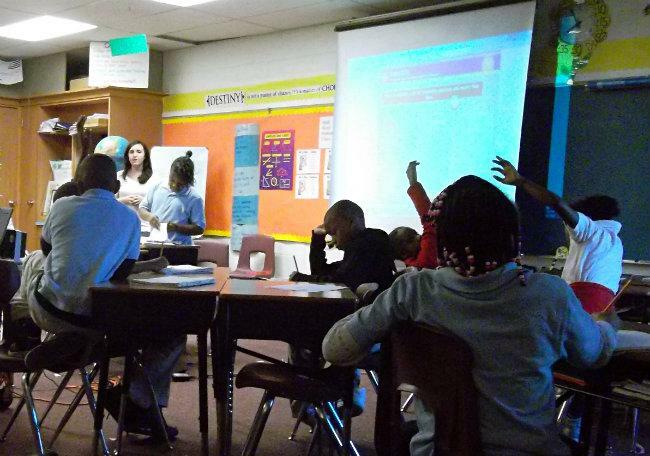 Students in Muskegon Heights are going through a lot of changes this year, because the entire school district was converted to a charter school system. After tackling some tough issues in the first half of the school year, the operators of the charter school system want the public to give them a full school year to put the changes in place.